It wasn't too long ago 4K TV was thought of exclusively as an expensive luxury. But then at CES 2014, Vizio introduced the first Ultra HD television under $1,000. And just this week, the company dropped the price of entry-level 4K TVs yet again with a new $599 (about £400, AU$768) screen. The 43-inch M-series (model number M43-C1) comes at an amazing bargain, but like you might be asking yourself right now, I wondered if there was a catch with this affordable option. 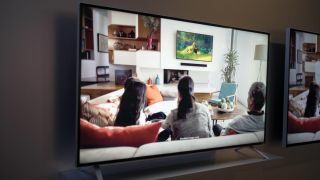 Following the news announcement, Vizio opened up a temporary showroom floor to display its latest M-series televisions with which it hopes to bring 4K to mainstream users. After staring at the M43 along with the wide selection of 4K screens Vizio had on hand for a good hour or so, I came away feeling that while these sets are affordable, they sorely lack the soul of a premium Ultra HD screen. Unlike every other 4K screen I had seen up to that point, I didn't feel the same revelation in improved image quality with the M43. It' s certainly sharper than your standard Full HD TV, and Vizio even strategically placed it next to a few of its E-series televisions, which house lower-res 1080p screens. With the 43-inch M-series you can discern more details from this riverside look at Big Ben in London to the finer details in this hillside. However, resolution is only one part of the equation. Most 4K screens I've laid my eyes on, from the Philips Brilliance 288P monitor to Samsung's 105-inch curved Ultra HD 4K TV, had a brilliance to them. Colors on a 4K screen should look warm and saturated and have an unbelievable level of contrast. With Vizio's screen I felt that hues were bright but nothing too memorable, and a shot of the London cityscape at night lacked an astonishing amount of contrast, failing to make it pop off the screen. That's not to say the screen looks terrible; it's actually quite nice and better than most other televisions you can get in the same price bracket. But when compared to other 4K TVs, it lacks the dazzle that makes the tech, however expensive, truly impressive. From Vizio's perspective, it wants to make 4K more accessible while still maintaining a high picture quality. "There is a lot of market traction for 4K TVs and panel prices are coming down, so we want to lead the market from the picture performance end," Parin Shah, senior product manager at Vizio, told me at the event. "We trying to drive the market with large volumes to really get the prices down." Shah said the M43 isn't an entry-level TV, and called the step up from [its Full HD TVs] "massive from a spec standpoint." On top of the 4K resolution, Shah explained Vizio's new M-series televisions also offer a remote with a keypad on its underside for quickly typing in the names of favorite programs and local dimming zones. The dimming zone feature allows the 43-inch screen to selectively decrease the amount of backlight illumination on parts of the screen to make for better black levels and higher contrast images. While that sounds great on paper, the entry level M-series set only has 28 local dimming zones. Spread across a 43-inch canvas, this means every LED illuminating the screen covers an area roughly the size of your fist, so the contrast control is good but only to a certain point. By comparison, Samsung has employed micro dimming to deliver twice the number of lighting zones for better contrast and color control in its 4K TVs. LG's 4K TVs, meanwhile, primarily employ emissive OLED technology, which means they bypass the need for a backlit screen as the display panel acts as its own light source while rendering an image at the same time. Of course, you have to keep in mind these other options are much more expensive than Vizio's M43 4K TV. Ultimately, though, Vizio feels the most demonstrable improvement in picture quality will be the increase in resolution to 3,840 x 2,160 pixels, up from the current 1080p standard. "A lot of apps are coming up with 4K content but at the same time the upscaling engine, it's getting better and better and you'll see a difference from the original Full HD content," Shah said. "It's a good-looking TV [that] you want to put it in your living room and you want to brag to your friends about it." Shah is right about the M43 being about bragging rights. 4K TVs for the most part are still exorbitantly expensive, so a $600 set could be the first big step towards opening it up to more users. 1080p televisions used to be just as expensive when the television world was moving up from standard definition. Eventually, affordable 1080p display options hit the market that were followed by a long series of screens with improved color, refresh rates, contrast ratios - and generally better looking televisions. Now, as for where 4K TVs fits into this timeline, I feel the technology is just finally starting to chip its way into more homes. The content is nowhere near ready with the exception of a few outliers like Daredevil on Netflix and the coming 4K reboot of Planet Earth. Likewise, Vizio's own M43 shows there's still some work to be done on the hardware side, but it seems 4K is on its way to becoming the new standard and more affordable options like Vizio's $599 TV will only help to get it there. Will high-dynamic range become the next must have TV technology?